Tim: Welcome back to Living With Money. Tim and Tom here today. 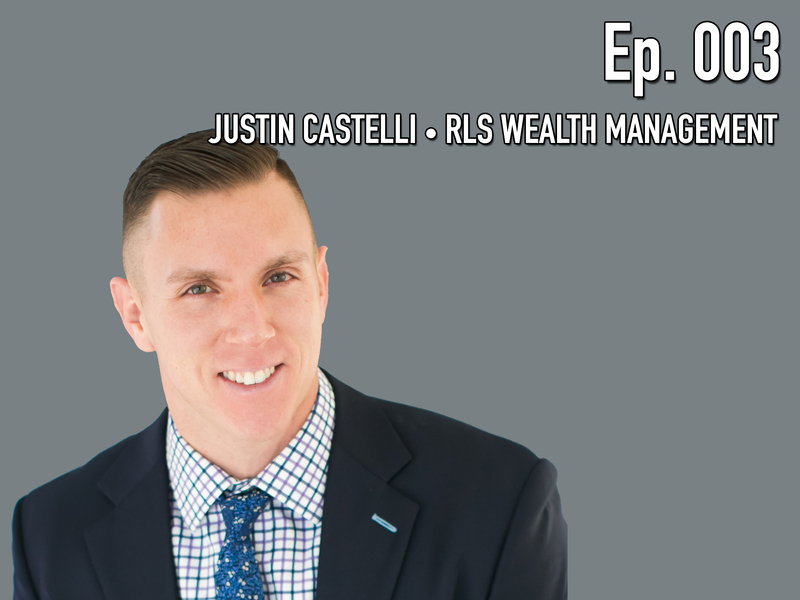 Our podcast guest for this episode is Justin Castelli. Justin is the founder of RLS Wealth Management out in Fishers, Indiana. One little quote that I found on Justin’s website that I really liked says that, “He believes that unbiased, independent advice should be available to everyone looking for it.” I thought that’s a really great quote and something that I believe as well. Justin, thanks for coming on. Justin: Thanks for having me on. I appreciate it. Tom: Hey, Justin. Tell us how you came with the name for your site. All about your Benjamins? Justin: I am a big hip hop fan. I grew up listening to rap and hip hop and at the old age of, soon to be 36, I still haven’t given it up. There is a song by a gentlemen by the name of Puff Daddy, or P. Diddy, I don’t know what he goes by anymore, but I loved the song, “All About The Benjamins” so I just decided I was going to name my blog All About Your Benjamins. I’m not a huge Puff Daddy fan, but a tribute to him and that song. Tim: Right, and it fits well with the topics that you talk about on the blog, so I thought it was a pretty clever name. Justin: Well, thank you. I try to work in hip hop whenever I can, so sometimes there’ll be … I’ll drop a little post about an album that comes out of I can squeeze in a video for a song that applies to what I wrote. I always try to influence some of my writing with the hip hop that I love. Tim: That’s awesome. So it says that you started RLS Wealth Management back in 2015 but just tell us a little bit how you got started in finance and your story of how you got to where you are today. Justin: Sure. I would love to tell you that it was destiny. That I knew I was going to get into finance. I grew up in Indianapolis, I went to a small Division III school just south of Indy to play basketball. Majored in economics, minored in political science and had every intention of going to law school and then the summer before my senior year I met who is now my wife. As our relationship evolved I knew I didn’t want to go to school for another three years so I decided it was time to figure out what it is that I wanted to do. At a small liberal arts school, even though I majored in econ I didn’t have a lot of business classes, I had one finance class, did okay in it but it didn’t really grab my attention at that time. My dad, after I graduated, helped me meet different people in different areas of business and I kept on coming back to meeting with different financial advisors. I really liked the aspect of working with people, finding problems. I really hadn’t fallen in love with investments at the time. But that’s how I found out about the profession. Like so many people that just get started, I ended up going to an insurance based firm, only lasted there a year because I knew that I didn’t want to base my recommendations on the planning that I did solely on life insurance. It has a place, but it’s not the end all be all for everybody. I was there for a year, spent a year at a bank and just didn’t like being confined to the bank space and then made it into with a company that did 403B business and I worked with a lot of teachers and that’s where I really found my identity as an advisor and knew that I wanted to one day go out and be independent, have my own firm. It took me a little while to get there. My career has always been in financial planning and advising, but I really didn’t hit my stride and really know this is my passion until I got to the 403B company. Tom: So when you were doing that were you actually out in the field talking to teachers or something in the main office? Justin: I was out in the field. The company that I worked for has a very big presence in Indianapolis. The school corporations that I worked with, they had the match account, so just like your 401K, the 403B, the school corporation we’d put money in. Everybody had a reason to meet with me. They had, at least, their match account with me. My approach to that opportunity always was I’m going to build relationships with people that even though I might have a non-compete, that eventually they’re going to want to continue to work with me later down the road when I go out on my own. I looked at it as an opportunity that I don’t have to cold call, I have a captive audience that has a reason to meet with me and I’m going to find those teachers and spouses who want a relationship with an advisor and do financial planning. I got my CFP while I was at that company so I knew that that was always going to be a stepping stone. Tom: What an opportunity just to be on the ground floor talking to people face to face. Great background material for what you’re doing today. Justin: Totally, totally. It was also good from a standpoint of trying to determine what type of advisor I wanted to be. While I was at that company I wasn’t totally captive in that I could only offer that company’s product, but there was a push to use the company products. There was a broker-dealer relationships so I was able to kind of go outside of the company and try to do the best that I could while I was there, but the biggest thing I didn’t like is I felt like I still was limited in what I could provide for my clients. While I could truly be a fiduciary within the constraints that I had, I wasn’t a fiduciary, I wasn’t able to do everything that was maybe the best for the client because my hands were tied and I couldn’t go out and use index funds, whoever it might have been. Tim: So you were talking about trying to figure out what kind of advisor you wanted to be when you started your own firm. How would you classify RLS Wealth Management today? How can your firm help people? Justin: I would classify my firm as one that really focuses on the financial planning aspect of the relationship. I try to write about investments on my blog and I’m really interested in the investment component of planning but I know that investments are a very small part of what it is that we do as advisors, and honestly going forward it’s becoming a commodity, it’s not why people work with advisors. The foundation to every one of my relationships is my clients financial plan that we tailor out to what their needs are. I really do financial planning, I don’t just say I do financial planning. We look at budget if that’s necessary, we look at student loan debt, that’s a part of the picture, estate planning, insurance. While I’m not selling any products to meet those needs, I’m making the recommendations of what that client might need to bring their plan into whole. The financial planning part is the foundation, but I think what I really want my firm to be known for is that I have different models to work with different types of people’s needs. One of the reasons I wanted to start my own company is I didn’t like having to tell good people that I couldn’t work with them because they didn’t have enough money. I think that’s one of the downsides to the old part of our industry. I think that the younger advisors, or at least advisors that see the future and the direction of where I think the industry’s going, are making different business models to be able to help different people. For instance, I have clients that I just work with on an hourly plan because their needs don’t extend beyond just needing a plan and some recommendations. I have a subscription model that’s geared more towards young professionals that it’s kind of a scaled down version of what I do with my older retirees, financial plan, investment managements a part of it, but it’s a little bit more hands off because I don’t think they need the full level of service that somebody nearing retirement needs. Then I have your traditional assets under management relationship, meeting a few times a year, more in depth relationship. I’ve tried to structure it that no matter who might call me or who might walk in my door, if I think I’m a good fit for them and I think they’re a good fit for my firm, I have a way to help them. So now I don’t have to tell anybody know unless I just don’t want to work with them because we don’t mesh well. Tim: So that’s the, I was reading on your website, that’s the wealth fusion program, right? That you were describing? The different models for different types of people? Justin: So, the wealth fusion actually is one of the models. Wealth fusion is the subscription model that I have for … It really could be for anybody based off of circumstances, but I really see it makes the most sense for young professionals. So that’s … The wealth fusion is that program. Me, being a millennial as well, I really resonate with that and that’s one thing that I think the industry needs to try and change because young people like us millennials, need help as well, and I think it’s really great that you have programs in place to be able to help those people. Justin: And obviously I agree since I’ve made part of my business going in that direction, but I would almost argue that millennials might even need more planning help than ever, because they’re coming out of school with more student loan debt than any other generation. Fewer and fewer people are going to have pensions, we’re living longer, and we really have a lot of time ahead of us before we get to that retirement goal and all the other goals along the way that if we can get younger people thinking about starting earlier, and having a way to start earlier, it’s going to put us in a better situation down the road for this generation to not be a burden on our children or society because we haven’t prepared. Our generation, I don’t think we get a pass to say, “Well, we didn’t know that we should have prepared because we know, we’ve watched our parents go through the great recession, we’ve watched all these other events in our lifetime that shows how important it is to plan ahead of time. It’s just unfortunate that so many advisors don’t have a way, or don’t want to work with those individuals. I understand why. From the old business model, assets under management, there’s not any money to be made working with people who don’t have money, and that’s why I think these other models, like the subscription model and the hourly model, or even the plan for fee models that you’re seeing become more common. I think that’s the solution. I think it’s going to take a change of the way clients view the way they work with us advisors to appreciate the value they’re getting for the fee because everything’s always been tied to investments. I don’t necessarily think that all of the public realizes how much goes into the planning and really what we get paid for is the planning, not the investment. Doing a subscription and doing an hourly planning sets that. You’re paying for the planning relationship, not for the investment. I think that this is just the beginning of maybe a longer term trend of shifting the focus and maybe the way that advisors are compensated down the road. Justin: To be more about the planning and not about the investment. Tom: This is really so important, the way that you’ve laid out this kind of vision. What do you think … You’ve been in the industry now, where do you see, in the next five to ten years, all of these different factions going? We’ve got the big firms where you need $750,000 or even $1 million to get in the door. You’ve got robo-advisors focusing on a completely different group of investors. Where do you see these lines crossing or do you think they’re going to stay separate as we move forward? Justin: I think there will always be separation. I think that how many clients are where lion’s share of the assets fall may be in the different sections. For instance, I think that going forward, and I don’t know why I think this, and it wasn’t a until I started my own company that I became opinionated in this way, I think that the bigger, you need $750,000 or more, kind of the wire house brand, for an example, I don’t think that the younger generations really see as much value in the name of a company as opposed to the individual you’re working with. I think that this trend that we see with the RIA space being the fastest growing area of our business, I think that’s where the lion’s share of the wealth is going to be going because people are wanting to work with people that they like, that they trust, that they know, not so much the name. I think that that side will always be there, because we’ll always be a certain demographic that likes that prestige, or sees the value there, but I think a growing number is going to be in the RIA space, the independent space, where it’s more about the person and the personal brand. I think the robo-advisors are a good fit. I think that there’s going to be a merge between more and more in the independent space leveraging the robo-advisor type of technology. And you kind of see those two blend together. Again, I don’t know what gives me the credibility to think that’s what’s going to happen, but I think that’s the direction it’s going to go and that’s why I’ve kind of structured my firm to be the way that it is, is to be able to meet that need as people are looking for it. Tom: You mentioned structuring your firm, what do you think has been the biggest eye opener or the big lesson as you opened your business? Justin: I think the biggest eye opener has been that it’s okay to be yourself. What I mean by that is prior to having my own firm where I get to be the chief compliance officer and the CEO and have the responsibilities that come with wearing that hat, but in previous lives I couldn’t do everything that I wanted to do, I couldn’t have a podcast, I couldn’t have a blog, I wouldn’t have been able to have Twitter, which is how I’ve met and learned so much over the last couple of years. That’s just naturally who I am. The writing that I want to do, that’s something I’ve always wanted to do, but I couldn’t. I had to kind of be somebody that I wasn’t or restrain myself from fully telling everybody who I am. Being on my own and being able to do those things and to see that what I think is what people want maybe that’s not right for everybody, but there are people looking for what I’m providing and they share the same vision as I do, even though I was told that probably wouldn’t work and I wouldn’t be successful doing it. I think it’s being yourself and letting that attract the people who you’re meant to be working with and not trying to force anything on yourself or the people that might come in. Tim: Yeah, I have to agree with that as well, because one of the biggest things I think for younger people, and pretty much most people in general, is trust. If you can tell that someone is genuinely being themselves it’s easier to trust that person and I think that’s really the basis of any good relationship in finance and outside of finance as well. Justin: And selfishly I think it’s a lot more fun to go to work every day where I get to be myself. You know, I’m not wearing … I don’t wear suits anymore, I try to dress trendy. I write about hip hop on my finance blog. I get to be me and that is a lot of fun because I’m not holding anything back. I also think that what I hope happens, it gives anybody who might, down the road, decide they want to work with me, they already have a good feel for who I am, what my beliefs are, my personality, so it allows them to determine whether or not they want to work with me before they might even call. I think there’s a lot of positives to just being in a position where you can be yourself. Tim: You were talking about dressing trendy and I wanted to bring this up as well. Your wife also owns her own business. I’m correct in saying that, right? Justin: Yeah she does. She has a little boys clothing boutique. It’s boys only. It’s called Roman and Leo, I’m going to plug it for her. It’s named after our first two boys, and then we just had our third, Silas. Unfortunately mom has decided she’s not going to re-brand. I used to give her a lot of grief for that, but I just finished … Well, I’m in the process of finishing up re-branding my company to add an S for Silas and it is a lot of work. She has a much bigger brand and a bigger presence than I do on social media. For us, it works and it’s great for our family. I always wanted my wife to have her own business. I never knew what it was going to be. I knew one day I wanted to go out on my own, just from an independent standpoint. The nice thing about it is being your own business owner brings a lot of responsibilities, but it also brings a lot of flexibility. We’re able … And I have more flexibility than her, since hers is a retail store, but we’re able to kind of form our business life around our family’s life, which means we both end up spending a lot of nights up late working, but that’s now become kind of our together time. Although we’re not always fully engaged with each other, we’re in the same room, we’re both working on work, and that works for us. It’s also nice to have your partner understand the struggle sometimes or the frustrations with running your own business and the headaches that come with it. They’d experienced it before, so they understand where you’re coming from. It’s also nice to have that support of somebody else that, again, is in the trenches, maybe not with you in the sense of your firm, but they’re in the trenches being a business owner and understanding things. It’s a lot of fun and honestly, I really take a lot of pride in the fact that we both have our own businesses. I really try to drive it home to the boys that it’s a pretty cool thing that your mom has her own store and mom works real hard. I want them to pick up on her work ethic and my work ethic and owning our own firm. I want them to get that entrepreneurial bug. I think it’s nice for us to both be in the same page when it comes to that. Tim: Definitely, and I think … This kind of segues nicely into the next question I have here. We like to ask everyone who comes on, how would you define being wealthy? Everyone has a different answer for this. Some people would say a lot of money, some people would say other things, so what does being wealthy mean to you? Justin: I gave this one a lot of thought, and I think five or six years ago it would have been more along the lines of money and wealth in the sense I think is the traditional form. I do think that having financial security is a part of being wealthy but as you get older and you see the bad that happens in some people’s lives and the unfair treatment that sometimes happens, I think wealthy really is once you get beyond being financially secure, whatever that means to you, it’s really everything else in life. It’s family, it’s experiencing life, it’s … I think that makes you wealthy. I think having a lot of money makes you rich, I think wealthy goes beyond being rich and it’s more of a holistic life and having all those pieces where they need to be. For me, wealthy is having a good family life, getting to spend a lot of time with my boys and doing fun things with them, which, financial security and stability allows me to do that. I think they kind of go together. Justin: The end game for me kind of goes back to my definition of wealthy. The end game for me is to be in a position where I control my destiny. I’m not tied to a company for my salary. Back to having two business owners, we have to provide our own insurance. There’s nothing that anybody can take away from me that if I was in a corporate environment I could lose my job, that means I lose my salary, I lose my benefits. My money and through my professional, my end is providing for us and for us to be in control. Ultimately I want to be in a position that I can grow this business the way I want to, work with people that I want to work to, but not sacrifice my family life. I would be more willing to slow down the growth of my business and slow down my financial growth in order to make sure that my family life doesn’t suffer. Tom: A lot of times we hear folks having, “Oh, I’ve got too much student load, I can’t do … I’m really limited, or I’m capped in terms of what my options are.” You made a video post on your site about a rant on millennials and savings. Can you just share a little bit about what you were trying to get across. Justin: That was a long time ago. That was an old video. I gotta think back to it. I don’t remember exactly what I said on that video, but I don’t think my thought on that has changed. I think in that video I quoted some numbers about where millennials are coming out of school with student loan debt relative to those generations in the past. When you adjust things for inflation, we’re not really that much worse. If you take what people who came out of college … Like, our parents came out of college with their debt and inflate that for inflation today’s terms, but then also inflate their starting year salary, we’re really not that worse off. We’re actually probably better off because we’re not coming out of college being drafted and going into the war and yanked away from our families. I think that while student loan debt is a bug number, and it is something that’s slowing down, the financial growth of a generation, I also think that complaining about it and woe is me is not the right answer. I also try, when I work with clients that do have student loan debt, I don’t know if there’s a right way to go about doing it, but I think that I try to approach attacking the student loan debt while also trying to accumulate a little wealth along the way. Rather than say, “We’re going to tackle student loan debt all the way,” and just focus solely on that, it’s, “We’re going to attack that heavy, but we’re also going to build up the emergency fund and we’re going to do a little bit of retirement investing so that we’re kind of making progress on multiple facets. What my experience has been, as much as we want to attack that student loan debt and that’s going to be our main focus, as we get through that, other things in life happen that complicate things and now we have debt somewhere else because we didn’t have any savings or we just never get around. I would rather piece things up and try to accomplish multiple goals at once, even if it may slow down paying down the student loan debt or something like that. I think the main premise of the rant to go back, yes it stinks we have a lot of debt, but so did people who came out of college before with debt, and they were making a lot less money, yet they somehow managed to do it. The way they did it was they lived below their means, they weren’t spoiled growing up and expected that coming out of college they’re going to maintain that lifestyle. Tom: We sit down with our clients all the time and one of the very first things that we ask them is, “Hey, what’s your number?” What’s that monthly number that you’re going to need to make ends meet each month. Tim and I have both met so many people who just refuse to acknowledge the balance in their bank account. They just go out and spend money recklessly all the time and they really can’t connect the dots in terms of connecting their current spending to their future problems, their debts and liabilities. It’s a big problem. Justin: Well, I think part of it is it’s not really taught. I remember in fifth grade in our math class we would be able to get points for doing different things and we had a checkbook and we would use a checkbook to keep track of our points and then at the end of the semester our teacher would put it in different things and we would have an auction and we’d write a check. Even though that wasn’t very complicated, it still taught us how to kind of balance a checkbook and track things and know how much you have and you can’t overbid what you have in your checking account. I don’t think there’s a lot of that that goes on. I think that’s part of it. I joke about the entitlement, but I do think that our generation has been spoiled coming up. I know if you wanted to be … If I was going to be honest, I was spoiled as a kid. I didn’t have a job all through high school. My job was basketball and school. Luckily, basketball gave me a good work ethic, but a lot of kids don’t have that, so they’re entitled. How easy is it to shop today and not track those things? I mean, the best thing Amazon ever did, which is the worst thing for all of us, is link your account up so you can one-click buy something. And you can buy from Instagram now. It just gets easier and easier to spend and it’s further and further removed from actually checking your banking account as you’re doing the spending. Tom: I have to admit that growing up in the 70s if you wanted to buy something you dug into your pocket and you look at how much cash you had. It was a pretty easy decision, “Do I have the money or not?” I completely understand where you’re coming from with that. It’s mindless now to just say, “Yeah, I’m going to get that. I’m going to get that.” It’s a tough bridge to gap. Tim: And kind of touching on it doesn’t … These things aren’t really taught anymore. A past interview that I had I talked with one of my friends who is a, he’s a math tutor, and he says he feels like math is getting worse in terms of what kids know. You having three young kids. Do you talk to them about money or anything? I know they’re still very young, but do you plan to either see what they’re learning in school and trying to supplement that to give them good personal finance habits? Justin: Definitely. I don’t know … What you guys have is pretty cool that you get to work with your dad. I would love for that to happen with my boys. The firm is named with their initials, I don’t know if that goes. We do a lot of math at home and luckily my oldest, Roman, he’s real good with numbers and he loves doing it. He’ll walk around and just ask you to give him two random numbers to add together and he tries to see how fast he can do it. Little brother Leo wants to do everything that Roman does. He’s five now and he’s working on adding because he wants to keep up with Roman. On top of that, on top of just quizzing them and being aware of what they’re doing at school, I’ve introduced them a little bit to investing and they know what I do for work, but I let them pick some stock. Leo picked Disney and Roman picked Nike, so I let them buy a couple shares. They have their own accounts. They got a quick lesson on what happens in the stock market because just like it always happens, they bought it and then the next week both stocks went down. So they both kind of stopped what they were doing, looked at the TV screen and then Leo, just being innocent, said, “Well, why didn’t they say my name.” He was thinking that he’s the only person with Disney stock. He’s like, “If they were talking about my stock, why didn’t they say Leo?” I explained to him that he’s one of many people who own it. It’s kind of cool that they picked up and that they knew that they had stock. Maybe they don’t understand what that means but they knew that that applied to them. I want them to understand that early on because I really didn’t … I mean, I knew how to save money and save up to buy but I didn’t do much investing growing up but I want them to get involved with that early on just because, as you guys know, time is our best friend when it comes to that. And they get started doing it earlier that puts them in a better position. Tim: Yeah, that’s really great. They don’t teach stuff like that in traditional school, so it’s definitely great having someone outside of school teaching you those types of concepts because, like you said, time is your best friend when you’re investing. We probably spoil our kids as well. I joke about our parents doing it, I’m doing the same thing to my kids. But at the same time, they’re learning how to manage money a little bit, as much as you can with a seven and a five year old. Tom: I’m curious, outside of the office, are you still working on your fade away jumper? Justin: You know, I don’t play basketball near as much as I would like to. It’s been tough to find a game somewhere. I play a lot with Roman and Leo’s starting to play basketball as well. In the summer we’re in the driveway playing. I might get a chance to play some pickup ball just a couple times a year. I miss it. But I’ve replaced my … If anybody has followed me anywhere on social media, you know what I’m about to say next. I’ve replaced my basketball with CrossFit. I still get my competitive fix from going to CrossFit and working out every day. Tim: I know a lot of my friends who used to play sports now have kind of transitioned into CrossFit as well. I know Brendan mentioned to me when you met him a couple years ago at the conference up in New York, he said that you could still dunk. Is that still true today? Justin: I’d have to get warmed up. It depends on the floor. You may not know this, but there’s different types of gym floors. For instance, in high school we got to play at Hinkle Fieldhouse, which is where Butler University plays. I, in warm up, had multiple dunks. There’s actually, there’s spring in that floor, the way the floor is set up. If I was at Hinkle, yeah I could dunk. Could I dunk on the concrete driveway at my house? Probably not. Tom: Now that you’ve been in the industry, what’s the one thing you’ve learned about money and about investing and about planning that you wish you knew ten or fifteen years ago? Justin: On a personal level, I knew it ten to fifteen years ago but I wish I would have acted on just starting early. I was saving and investing earlier, but I wish I would have done more. I think from a practice standpoint, I wish I would have understood and appreciated even more how emotional money is for people. More on the fact that that is … Today, and I’m still learning this, but it really helps me do my job, I think, to the best of my abilities to understand how people relate to their money, and everybody’s different. Now it’s, “How do I structure it so that the numbers work, but also that this is something that this person can actually carry out?” Because what good is a plan that looks good on paper but never actually gets implemented because it doesn’t fit with the persons values or their personality traits. I think that understanding that relationship between money and emotions and the whole behavior finance topic, I wish I would have known that from a business standpoint ten years ago. Tim: We’ve talked a lot about the younger generations and millennials and learning about personal finance and stuff like that. For any millennials out there listening, what would you say is the most important thing that you could tell someone just entering the workforce today? Justin: I’m going to give you two. One is the obvious, start early. Actually I’ll give you three. Start early, live below your means, and this, the final one, kind of ties with live below your means is don’t judge yourself against other people. Going back to how you can shop on Instagram and social media, there’s a lot of, for another rap song, there’s a lot of fronting that goes on and I mean that there’s a lot of people that create this image that they want people to think is their life, when it’s really not. You might be following a friend of yours from high school and it looks like they’re living this extravagant life when really they’re stopping in front of expensive cars on the street taking pictures and making it look like that’s what they own. I think if you focus on yourself and focus on what your goals are and don’t worry about what everybody else is doing, you’re probably going to be much better off than what you think those others are really living. It’s big homes and expensive cars, as we’ve seen in the past, can be funded by debt. It’s a facade, it’s not really that person’s reality so don’t try to keep up with that, just focus on your own. Tim: I mean, that’s really good advice. All right, well, just wanted to say thanks again, Justin, for coming on. It was a pleasure talking to you. Justin: Thanks for having me on. I appreciate it as well and, as I mentioned with you before we got on, I’m going to have to have you on my podcast so we can maybe take this and I can flip the questions onto you and let you tell me more about your thoughts on everything. Tim: Absolutely. Looking forward to that. We’ll link in the show notes, but like we said, Justin is the founder of RLS Wealth Management, we’ll put the website and contact information for Justin on the show notes. Also check out his blog, All About Your Benjamins. You can find that at allaboutyourbenjamins.com. He also just started a podcast like he just mentioned so be sure to check that out. If you’re listening to this on iTunes, please subscribe to the podcast to get new episodes every week. Feel free to leave us a review or a comment because it would really mean a lot to us. Be sure to follow us on Twitter and Instagram @LWM_podcast for more news and updates about the show.